On a broad level ‘culture’ is defined by Ferrante as, “the way of life of a people.” But through the paradigm of sociology, the term is multi-faceted with many different interpretations and applications. In this essay I will discuss how my understanding of the concept of culture has deepened and apply it to analyze contemporary American culture. As an aspiring nomad with dreams of traveling the world and seeing it all, ‘culture’ is a commonplace term in my vocabulary. Prior to giving the concept of culture any reflection, I considered the term to be fairly one-dimensional and static. 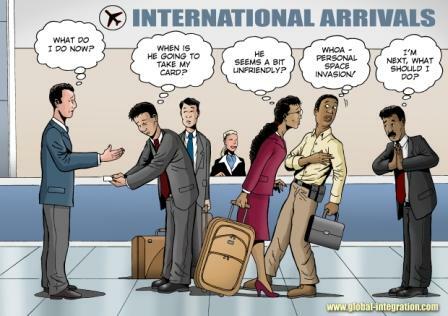 As the picture below illustrates, I only saw culture as generalized behaviors and actions that reflected the customs of a country. Like Ferrante, I hold that culture is best defined through core concepts. Drawing from her work and my experiences as a traveler there are two concepts I find to be the most true. The first concept is that culture consists of material and non-material components. Ferrante defines material culture as physical objects or things to which people have attached meaning (61). Nonmaterial culture, on the other hand, is comprised of norms, beliefs, values, symbols and language. The second concept is that geographic and historical forces shape culture. In addition to Ferrante’s two concepts, my definition of culture includes a third, which has directly contributed to my deeper understanding of the concept of culture. Professor Miles Richardson of Louisiana State University notes that culture is more than a blueprint or something we learn as humans. It is also an active process that invites creativity and innovation. Similarly, Professor Warren J. Samuels of Michigan State University adds that culture is an artifact subject to continuos social reconstruction. With a newfound grasp and revolutionized outlook on culture, I will now use the three concepts listed above to analyze contemporary American culture. It is important to note that for the sake of space I have excluded material components from my analysis. What makes me American besides evidence of citizenship? Avoid the distraction of random road trip scenery featured in this video and listen to the questions posed by the narrator. As a nation that refers to ourselves as “The Melting Pot,” what ties us together? Some might say that our cultural values are reflected in founding documents such as the Constitution and the Declaration of Independence. Conversely, some Americans argue that such documents are outdated and irrelevant in our society today. The Pledge of Allegiance refers to America as “one nation under God,” but 15% of Americans don’t value religion in their lives. America is regarded as an English-speaking country, but it is not uncommon to overhear French or Spanish in New York City, or even East Burlington. And as the video mentioned, with over 300 million people in our country, do we actually have norms reflective of American culture as a whole? Combining norms and patriotism, some American citizens find it extremely disrespectful if one does not put his hand on his heart during the Pledge of Allegiance, yet there are still many who do so and do not see it as an issue. Although America is a heterogeneous society abundant with subcultures created by class, gender, religion, ethnicity, sexual orientation, and education, there are two dominant values that define American culture: individualism and exceptionalism. While individualism is a value that has emerged over the course of American history, which will be discussed in the next section, exceptionalism is a value that has been with this country from the beginning. Like ‘culture’ the term ‘American exceptionalism’ can be examined in many ways. As the comic illustrates, it can be associated with foreign policy. 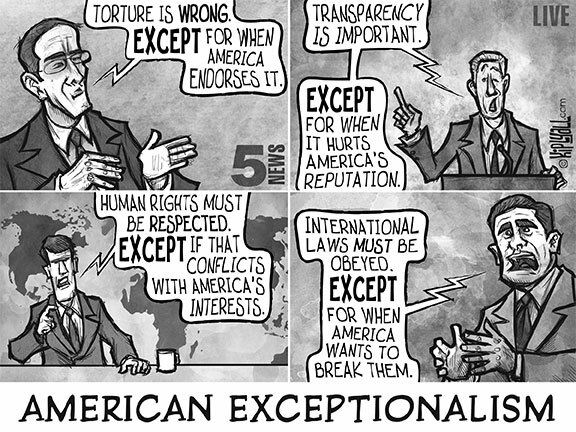 In the scope of the world, American exceptionalism is a parallel to ethnocentrism. As we discussed in class, American exceptionalism is the idea that the United States is the best country in the world and has a notch above any other nation. But what makes us think we have the right to control other countries and dictate what they should believe? Edgerton’s intriguing comment alludes to the function of cultural relativity in our contemporary society. Time and time again Americans become outraged at international headlines that detail acts we deem inhumane. The challenging question in this regard is how should Americans engage in international cultural beliefs? Should we remain passive agents in this cultural exchange by simply learning about cruel and violent acts? If we examined such acts through a combination of functionalism and cultural relativity would we discover the perspective that justifies such acts in said country’s society? Or as “the greatest country in the world” is it America’s duty to be an active agent of culture as described by Miles Richardson and call for innovation and change? In the previous section, I noted that contemporary American culture is largely defined as heterogeneous. In smaller-sized countries like Bhutan and Iceland, the culture is homogenous. America is comprised of many different geographic regions that function as subcultures, such as the Bible Belt and the Northeast. Thomas C. Wilson of Gannon University conducted a study that found an independent size-heterogenity relationship for political and sexual attitudes, which are representative of attidunal elements of subcultures.The country is so full of cultural diversity, subcultures can be broken down to states, or even towns. For example, the non-material culture of Charlotte and Raleigh residents would be completely different than that of Eustace Conway and other Boone residents. While American exceptionalism has long been a cultural value for our nation, historical forces have shaped the more widespread and prevalent value of individualism. Studies and research show that the origins of individualism in America began in the 1960s. In his textbook, American Society, Robin M. Williams Jr. presents the idea that American individualism is not a “lone cowboy” culture, but rather an emphasis on “individual personality rather than group identity and responsibility.” Individualism constitutes that self comes before others. But can this value apply to individuals others consider to be ‘selfless?’ How does charity relate to individualism? Consider the social exchange theory, which states there’s no such thing as a gift. In other words, people involved in volunteer work or charity are still acting on behalf of self. Their actions are self-motivated because although they are helping others, they are doing so because they enjoy it and it makes them happy. I’ve included this concept as part of my analyzation because it explains all of the above content. In life we go through different stages in terms of how we interact with culture. As toddlers, we observe our surroundings and absorb them. As we grow older, our environment grows with us. We exit out of the house and enter school, sports teams, and jobs. We begin to question things rather than merely accept them. We develop viewpoints and interests that serve as filters on our intake of culture. Essentially, our interaction with culture starts as passive and evolves into an active process. Arcaro, Thomas. “Culture.” Introduction to Sociology. North Carolina, Elon. 19 and 21 Feb 2013. Lecture. Ferrante, Joan. Sociology: A Global Perspective. Belmont, CA: Wadsworth, 2008. Fischer, Claude S. “Paradoxes Of American Individualism.” Sociological Forum 23.2 (2008): 363-372. SocINDEX with Full Text. Web. 27 Feb. 2013. Huntington, Samuel P., and Lawrence E. Harrison. Culture Matters : How Values Shape Human Progress. n.p. : Basic Books, 2000. eBook Collection (EBSCOhost). Web. 27 Feb. 2013. Richardson, Miles. “Culture and the Struggle to be Human.” Anthropology and Humanism Quarterly 1.3 (1976): 2-4. Web. 27 Feb 2013. Samuels, Warren J. “Dynamics Of Cultural Change.” Society 29.1 (1991): 23-26. SocINDEX with Full Text. Web. 27 Feb. 2013. Stewart, Alan E. “Explorations In The Meanings Of Excellence And Its Importance For Counselors: The Culture Of Excellence In The United States.” Journal Of Counseling & Development 88.2 (2010): 189-195. SocINDEX with Full Text. Web. 27 Feb. 2013. Wilson, Thomas C. “Population Size and Social Heterogeneity: A Empirical Test.” American Journal of Sociology 91.5 (1986): 1154-1169. Web 27 Feb. 2013.